The Parkway Panthers and Benton Tigers were the only Bossier Parish teams to advance to the second round of the LHSAA state football playoffs Friday night. Parkway built a 27-0 halftime lead behind three Keondre Wudtee touchdown passes and an 87-yard run by Robert McKnight en route to a 46-14 victory over Natchitoches Central in the first round of the Class 5A playoffs at Preston Crownover Stadium. The No. 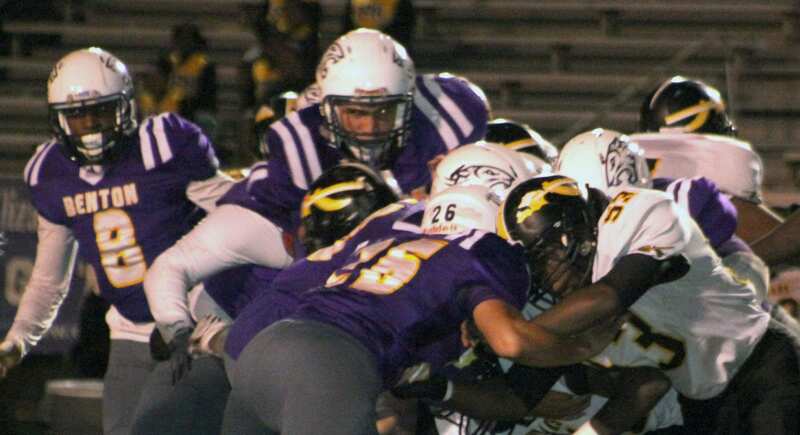 6 seed Panthers (10-1) will host two-time defending state champion Acadiana (9-2), the No. 11 seed, in the second round next week. Acadiana routed Central Lafourche 55-7 in its first-round game. The game will be a rematch of the 2013 state championship game. Acadiana’s veer option offense was too much for the Panthers to handle in a 77-41 loss. Friday’s game was the first playoff home game for Parkway since 2012 because of LHSAA sanctions. District 1-4A champion Benton, the No. 4 seed, avoided an upset bid by district rival and No. 29 seed Fair Park. Sophomore Brooks Cram kicked a 31-yard field goal with 9 seconds left to lift the Tigers to a 17-14 victory. Benton (10-1) will host the No. 13 McDonogh 35, a 26-6 winner over Woodlawn, in the second round next week. Elsewhere in Class 5A, No. 16 Airline fell to No. 17 Ponchatoula 21-17 at Airline Stadium and Haughton dropped a 33-27 decision to Barbe in Lake Charles. In Class 1A, No. 16 seed Oberlin ended No. 17 Plain Dealing’s season 32-18 in Oberlin. Airline closed its season 7-4 after a 7-0 start. Ponchatoula took a 21-10 lead late in the third quarter, but Coby McGee returned the ensuing kickoff 86 yards for a touchdown. The Vikings recovered a fumble early in the fourth quarter but couldn’t take advantage. Airline had one final chance late in the game, taking over at its 29 with 47 seconds left and no time outs. Thomas McKain completed three passes to move the Vikings to the 25 with 8 seconds left. He completed another pass and the receiver went out of bounds inside the 20 with 4 seconds left, but the Vikings were called for holding. A Hail Mary pass was batted down just in front of the goalline as time expired. Haughton led Barbe 27-12 in the second half, but the Lake Charles squad rallied for the win, scoring the go-ahead TD with 1:20 left. The loss marked the end of Rodney Guin’s 16-year tenure as head coach. Plain Dealing ended its first season under head coach James Thurman 3-8.